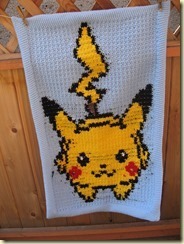 I am back to talk about the Pikachu Bobble Stitch Pixel Blanket I started a long while back. 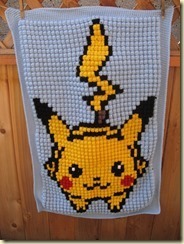 As you know I started this months ago and finally finished a couple of weeks ago after I got back from my trip to the UK. I will be writing about my trip in a later post :) I loved it there! Note: I highly recommend printing out the graph onto paper so you can cross out the bobbles you have done so you don’t lose your place.